Adding/Removing Sub-Pixel Hinting - Linux/KDE. If you run a Linux/UNIX-like operating system, you will no doubt like the file-level security that exists. If you save files on a USB Flash Drive, then you will probably want to make it more difficult for you to change by accident certain files that are on a USB Flash Drive and this is where UNIX-like file system permissions come in to play. Taking into account that the files can always be copied, if you want to make it effectively impossible for people to read files that are on there, you should also use some form of encryption. With FAT, there are only 26 letters of the alphabet. Therefore, if you have two files: one called 'Index.html' and the other called 'index.html', the later one that is written to the directory will overwrite the former one (theoretically, there are 512 possible index.html file names with capitalisation in all of the variations such as 'index.html', 'inDEX.hTMl' or 'InDex.HTMl' which FAT sees only as one file name). So, how do we get around these inflexibilities? The answer is that we can format the USB Flash Drive with a UNIX-like file system such as ReiserFS (this also has the advantage that it is a proper journalling file system). Open up Control Center and select 'YaST2 modules'/ 'System'/ 'Partitioner'. On the right, you will see a warning appear. Click on 'Yes'. This is the drive and partition display - heavily condensed. Our USB Flash Drive - being a serial device - is in '/dev/sdc' and has a FAT32 partition in '/dev/sdc1'. We need to get rid of this, replacing it - for the purposes of this tutorial - with a Fat32 partition and a ReiserFS partition. So, make sure that the existing Fat32 partition is highlighted and then click on 'Delete'. Don't worry about making a mistake with the previous step because you are protected by a query box. If you are sure that you have selected the correct partition, click on 'Yes'. Now, it looks like this with only the disk listed - in this case, '/dev/sdc'. Next, we have to put some partitions on it. Click on 'Create' and the dialogue box on the right appears. This allows you to select the drive that you want to create a partition on. In this case, it is '/dev/sdc'. Next, you will be asked what type of partition you want to create (so, even if you did select the wrong one in the last dialogue box, you can still select 'cancel'). We'll select 'Primary' - you are allowed four primary partitions. This is the dialogue box that we'll use to create our partition. In the 'Format' frame, we need to select our file system - as there are no file systems on the partition yet, the 'Format' radio button is already set. Click on the drop-down combo - it is already set to 'Reiser' which is the default. 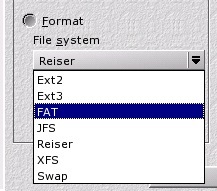 Select 'FAT' from the list - you can see that there are a number of file systems that you can choose from: some journalling and some not. If you click on 'Options', you get the dialogue box on the right. It allows you to specify the number of FATs in the file system, the size of the FATs (12-, 16- or 32-bit) and the number of root directory entries. These are all set to reasonable defaults by the system, according to the size of the partition you want to specify so there is no real need to specify them here. Next, we need to specify the number of cylinders that this partition will have. 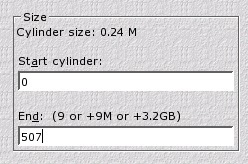 There are 1015 cylinders on this drive (0-1014) so, as we want to make two, roughly equal partitions, I have typed 507 for the end cylinder. Following that, we need to specify that the partition doesn't get mounted in the file system - we want to be able to remove it and not have it there at boot up time. 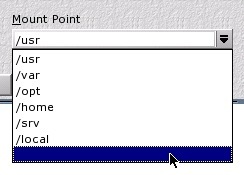 So, select the blank option in 'Mount Point'. Finally, it looks like this. Note the 'F' in the column before 'Fat32' - that means that it will format this partition. Repeat the process although, this time, we choose a ReiserFS format for the partition. Note that the start cylinder number has been inserted automatically - this is a fence-post issue so 507 was the last one of the first partition and 508 is the first cylinder of this partition. We could, instead of accepting 1014 as the last, choose a lower number if we wanted to put further partitions on it but we will not. Again, we select no mount point. It now looks like this. We are all ready to proceed. Actually, we haven't done anything to the drive up until this point. Now, things will change. We are presented with a list of changes and we can still chicken out if we want to. If the list of things on the right is what we really want to do, click on 'Finish' (or 'Apply' if there are other things we want to do later on). You can, of course, do these actions one at a time by clicking on 'Apply' each time. If you clicked on 'Apply', you should see something like the shot on the right. We now have a 125MB Fat32 partition that is readable by Windows (including Windows 98SE which works without any fuss with that partition) and just about any other operating system on the planet; and a 124.7MB ReiserFS partition that is readable by Linux. We can now take the drive out and, as there was nothing written to the /etc/fstab file, next time we start Linux (sounds a bit incongruous), the system will not search for that drive and (if it was) would not then fail to find it and dump you at the command line so that you can edit the /etc/fstab file using 'vi'. Cheap, supermarket paper is a God-send if you have children using your printer all of the time but its quality can vary between 'very good' and 'execrable': sometimes it feeds and prints beautifully and other times ... well ... forget the ink bleeding through it, you can read a newspaper through it (yes, you really can). By definition, a sheet of DIN A4 paper is 1/16th of a square metre. The standard is that A0 has an area of 1m2 and has a ratio of short to long side lengths of 1 to the square root of 2 (1:1.414). If you then slice an A0 sheet in half, it now has a ratio of 1:0.7071. If you invert it and multiply it by 1.414, you get 1:1.414 again. This means that you can slice it in half any number of times and you always get the same aspect ratio. To find the area (in square metres) of a sheet of DIN A paper, the area = 1/2x where x is the number of the paper so, for A4, 1/2x is the same as 1/24 or 1/16m2. Paper is sold as a certain weight per unit area - usually 80GSM which means that one square metre weighs 80 grammes. So, if we know the weight per unit area of the paper and the area, we can work out how much it should weigh. Nowadays, a ream is 500 sheets so 500/16 = 31.25 m2. If you multiply this by the weight for a square metre (80 grammes), you get the weight of a ream which is, for 80GSM, 2.5kg. For 70GSM, it is just under 2.2kg. Normally, you would find 80GSM but card is usually 120GSM (or even heavier, depending upon your intended purpose) and 'Bank' paper is 40GSM (this is really light and used for typing records on where you have a lot of records to keep using as little weight of paper as you can get away with). You can also get 75GSM and 70GSM which have advantages if you are putting manuscripts through the post as every gramme saved works out cheaper in postage. So, when is 80GSM paper not 80GSM? Arguably, you could claim that if it worked out at 75GSM, it wasn't within the 80GSM range any more but quite a lot of the weight of paper is actually water and if you keep paper badly - in too dry an environment for too long - it can lose water and therefore weight. As an experienced paper purchaser myself, I would argue that if a ream of 80GSM clocked in at 2.2kg, it was well out of range and should be called 70GSM. So, if you are thinking of buying some cheap, supermarket paper, get a ream of it and weigh it on one of the sets of scales in the fresh veg section or get one of the cashiers to weigh it at a spare checkout. Paper is effectively sold by weight so if your ream of 80GSM paper weighs in closer to 70GSM, it is a Weights and Measures issue that needs to be addressed as it could be construed as 'passing off'. Sendmail is one of those programs that is particularly useful. The screenshot on the right shows a typical session. First of all, you call it using its full path (which is normally /usr/lib although it can be in other places) and then, use the 'From:', 'To:', 'Subject:' and any other lines you need ('Cc:' and 'Bcc:' for instance) and then, leave a blank line (if you use the '-t' switch: see 'man sendmail' on the command line or click here man://sendmail for more details). Next, you type in your message and then, when you have finished, you put a full stop on a line on its own (nothing before or after it) and then press [Enter]. 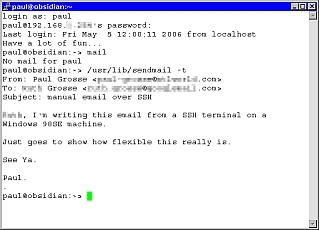 Sendmail then sends the email for you. 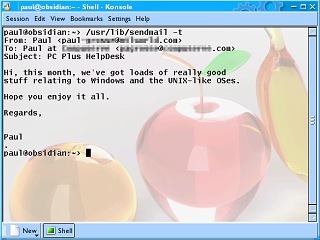 Even if you can't get to your computer but you can log into it, you can still use Sendmail because it is used from the command line. The session in the screenshot on the right is taken from a Windows98SE machine using an ssh session. You can see that exactly the same thing happens. So, we know that we can send emails using it and that it is interactive but how do we send an email from within a program? Here's how to do it in Perl. # with you - perhaps sending a report automatically on a daily basis. # going to get the program to do is to change the above message. # Start off by creating the message in the $msg scalar. # Note that you need to have a 'From:', a 'To:' and a 'Subject:' line. # Next, you need to leave a blank line and then your message. # were using sendmail from the command line. # if you change your configuration. # string that the program is producing is working all right. # change the location of sendmail if it is in a different place. # system by using 'man sendmail'. By opening sendmail - complete with any command line arguments that it needs such as -i so that it looks for an EOF rather than a '.' - as a pipe, we can print to it and when we close it, we effectively send it the EOF that it is looking for. Although this is in Perl, it is easy enough to translate it to any other programming language. Sub-pixel hinting has been around for a while but only recently has the price of flat-screen monitors come down so that a substantial proportion of the user population can enjoy them. Okay, so Microsoft's PR people don't know how to do the maths because a 300 per cent improvement would mean it was 4 times as good but, as you will see below, it could, at the most be only 3 times as good, hence an improvement of resolution by 200 per cent. So, taking that into account, can it be three times as good? One problem is the fact that the red and the blue are not perceived as being as bright by the eye which means that they cannot produce a sub-pixel effect that is as good as the green sub-pixel. Very roughly, the perceived brightness of red added to that of blue is around that of green so there goes another 100 per cent. Often, you'll see sub-pixel hinting examples where the lines in the original are all 1 pixel wide so that there is no colour cast added to the line when the line is hinted. In reality, one-pixel-wide lines do not happen with any great frequency - especially with fonts - so you will most likely see added colour casts to your letters. Vertical lines such as those in 'l's, 'I's and 'T's, and even the shorter lines in 'm's, 'n's and 'p's will generate a cast that is uniform along their length so you might end up with a 'T' with a red or blue vertical line. Also, even on a flat-panel monitor, the text is quite often blurry when it is sub-pixel hinted. In addition, your graphics card is now processing three times as many 'pixels' as it was - a 1024x768 display now has the dimensions 3072x768 pixels so it is more processor intensive (even if it is your graphics processor, it is still your electricity bill). As straight characters often fall foul of sub-pixel hinting casts, italics are where sub-pixel hinting really works well. If you only view italic print then this is for you. 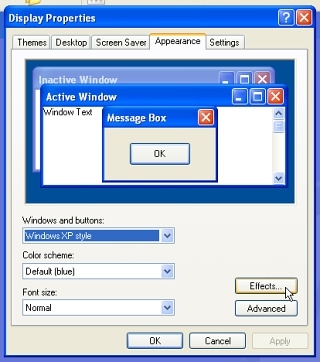 The Windows version only supports (on XP Home) horizontal sub-pixel hinting so if you are using a TFT monitor that you can rotate through 90 degrees so that you can do DTP more efficiently, you are not supported. So, does it provide a '300 percent increase in image resolution'? in a real life environment, 100 percent is probably as much of an improvement as you will see and then only if you are completely colour blind (so that the colour fringes don't irritate you). So, if you look over the next few items, you will learn how it works and can judge for yourself that if you try it out and you decide that you don't like it, you will know that it is sub-pixel hinting that you are blaming rather than something else. This is an actual TFT display showing the cells. The cells are so tiny that you would be convinced that they were square. If you are using a TFT with the cells in order of RGB, you should see that the distance between the blue and red is a lot smaller - they might well appear to be touching. You will see this without using any sub-pixel hinting (which doesn't affect pixmap images such as the GIF on the right). In fact, there is a one-pixel-wide line of black between the red and green, the green and blue and a third between the blue and red - even though it doesn't look like it (get a magnifying glass out and look at the screen). This is, in effect, an example of sub-pixel hinting (well, shifting stuff around the screen by amounts smaller than a pixel) because the red displays a third of a pixel to the left and the blue displays a third of a pixel to the right, hence the gap being smaller. Just in case you were wondering if it was only red green and blue it does this with, have a look at this yellow, magenta and cyan screen - if you think of yellow being the complimentary colour of blue, magenta of green and cyan of red, when we have a white line in between, it also works between the yellow and cyan (complimentary blue and red). This is the mask that we are going to put our text on. You can see that it mimics the real screen that is shown above. This is the letter we want to put on it - a lower-case 'y'. You can see that we are asking for a hopelessly large amount of detail to put in there but in reality, you wouldn't expect much from a small letter like this as long as the shape made sense in context - a lot of reading is recognising the overall shape of a word rather than identifying each letter individually. This is what we get. If you almost close your eyes, you can make out that it is a 'y'. This is what it looks like if you add the three colours together so you have what your eye would expect to see and, at the scale it is supposed to be at, it looks like this: . If, instead of taking the pixel location and finding out how much of the pixel is covered by a line, we look at each third of a pixel and see how much of that is covered by each line, we generate colours instead of grey scale. As a result of this, you can see in the image on the right that there appear to be diagonal lines that are only 1 sub-pixel wide - you can see this especially at the lower end of the y's tail where it is only a blue pixel wide. If we look at the colours generated, we end up with the image on the right. Note that where there is a horizontal structure that goes all of the way across a full pixel, the resulting colour is a grey - as in the horizontal bars at the top of each branch of the 'y'. Whilst the colours in the image on the right might seem to be utterly wild, a blue next to an orange will, at the pixel level cancel out to make a grey average over two pixels. However, on the sub-pixel level they are two dark sides of adjacent pixels. If you look at the part near to the middle that is orange, blue, red, you can see in the image above that it is the bottom of the 'v' part of the y, just above the row where they meet. If you look at the actual-scale image of the 'y' below, you can see that the colours have largely disappeared. It is when they do not disappear that they can be an annoyance. At the scale it is supposed to be viewed at, it looks like this: . If you compare the two, side by side, they look like this (pixel, then sub-pixel) - . If you have a TFT monitor, you will be able to see that the sub-pixel hinting version is a lot clearer if you ignore the peculiar colours that you sometimes get. 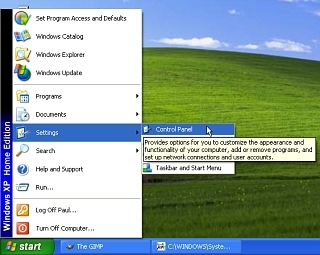 This is done on the default (SP2) installation of Windows XP home without any plug-ins or toys. Next, select 'Appearance and Themes'. Now, we have the 'Display Properties' dialogue box. If you had the other type of Control Panel display, you could have got to this stage just by clicking on Display. Next, select the 'Appearance' tab and then, click on 'Effects...'. Now, we see the 'Effects' dialogue box. 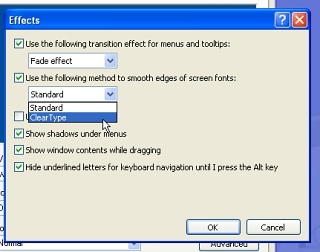 Make sure that the 'Use the following method to smooth edges of screen fonts:' (yes, no definite article) checkbox is checked and then select 'ClearType' from the dropdown combo box. You can see that the contrast is greatly reduced and that there are some chromatic aberrations around the letters. It's a bit like looking at it through a dirty lens. You can see that just about every vertical has been extended into the pixel on the left (the red line of pixels up the left) and is an example of poor font placement. This has the effect of smudging it. Like Windows XP above, this is done on the default installation of KDE without any plug-ins or toys. 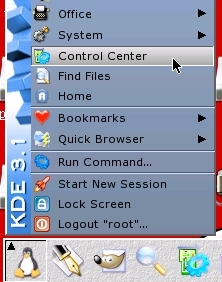 Fist of all, click on the KDE menu and select Control Center. 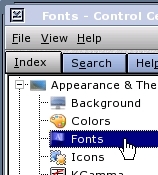 Next, under 'Appearance and Themes', select 'Fonts'. Following that, in the 'Anti-Aliasing' frame, check 'Use anti-aliasing for fonts' and 'Use sub-pixel hinting:'. 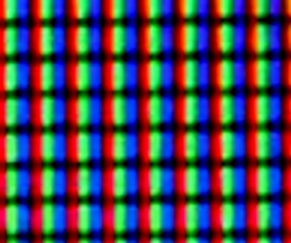 Vertical RGB and Vertical BGR cater for vertical screens so that: if you are using either a flat-panel monitor for DTP and have turned the screen round by 90 degrees (to the left or the right - it doesn't matter as you have RGB and BGR in the vertical option); or, if you are using a small computer with a vertically oriented screen - say for reading an electronic book, you can do so. You can see that the font placement is a lot better than in Microsoft's version. The contrast between the vertical bars and any adjacent smudging is far greater so any smudging is only minimal - this is largely down to the choice of a better font and better font placement to start with. With other fonts at the right (wrong) size, the effect is just as psychedelic as in the Microsoft version. However, if you do want it, you can - with the KDE version - use it with any flat-panel display regardless of orientation.